RUTLAND—The Vermont Farmers Food Center will be hosting its second annual Harvest Fest, a feast and fundraiser, Sunday, Aug. 14. Besides local food, drinks, hors d’oeuvres and music the VFFC will be doing something unique: they will be auctioning “scarecrows.” Each will be created by local artists, including Mary Crowley, Norma Montagne, Christine Holzschuh, Karen Seward, Christine Townsend, Ann McFarren, Bekah Fenn, David Moakley and Alice Sciori. The artists chose to help not only for their love of art but also for their love of the farmers market, many shared. The scarecrows have been on display around the Rutland area over the past few the weeks leading up to the event. This week, features profiles on Sciori, Seward, Townsend, McFarren, Fenn and the EMMA piece that will also be for auction. See mountiantimes.info for profiles on Crowley, Montagne, Holzschuh and Moakley that ran in an earlier edition. When Alice Sciore was first introduced to the scarecrow project, one of her previous sketches came to mind for inspiration. “Before I was invited to participate, I became in love with and consumed by a pencil drawing I did. I just fell in love with it and it was on my mind,” Sciori explained of her inspiration. While the drawing looked good on paper, the sculpting process was a bit harder than Sciori thought it would be, she contined. “I was going to buy chicken wire but I knew I’d probably scratch myself to death, so I found chicken fencing. It’s like the chicken wire but plastic. Then I rolled it and shaped it to a form that I wanted,” she described. Sciori added old pieces of fabric she had collected, including an old jumper and an old General Mills grain bag. 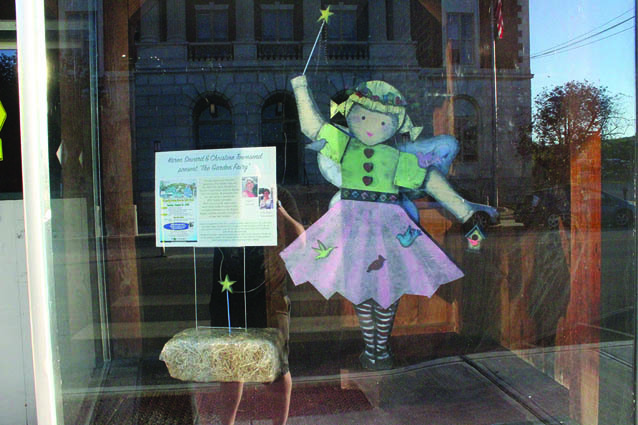 What’s unique about the “Garden Fairy” is she is not only interchangeable for the seasons, made out of different pieces of wood and veneer. She was also created by two artists. “Karen and I have worked together at different times, so we came up with an idea and decided we wanted to do it together. It was good to do this together because we have never done something like this before,” Christine Townsend said. “As we put her together, even though we put a lot of thought into it before hand, as you’re doing it, you see more of what you really need to do or not to do. It was an experience and a learning curve for us on how we would put the wood together,” she continued. When Ann McFarren first began to think about what her scarecrow would be, she thought of an artist. But she figured one of the other artists would be doing that, so McFarren came up with another idea. “I thought, well it is for the farmer’s market, let’s try and do something outdoorsy. So I came up with a bird watcher on the spur of the moment,” McFarren said. McFarren soon started to design and gather pieces for “Ms. Philomena Feathersworth.” She didn’t work alone on the project; her granddaughter Bekah Fenn helped McFarren with the scarecrow by sowing on the eyes, creating the hair and braid and also by gathering materials. Being a painter, McFarren wasn’t sure how to go about constructing the scarecrow. “At first I thought I didn’t know what I was doing here, but it was a fun thing. I said, Bekah I’m going to get you to help me with this,” McFarren said. “After we got all of our materials together it took us one day to do her,” she continued. Besides “Ms. Philomena Feathersworth” McFarren has also donated a painting for the auction. The East Mountain Mentor Artists (EMMA) is a group of 10 artists who help mentor one another and work together. Founder Christine Holzschuh got the idea for EMMA from an online blog radio called “Artists Helping Artist.” The idea behind the group is to support each other not just as artist but also as human beings. When the group was being formed they decided that they want to do community work because art is for everyone, they explained. “Poetry, music, dance, all of it really adds a dimension to the community that is critical. It’s critical like education is critical, like church and religion is critical to people,” Holzschuh said. “It’s something that is part of who we are, even if people aren’t producing artwork there’s a need to be exposed to it. Art enriches our lives, makes us think deeper and appreciate what’s around us,” she continued. EMMA as a group decided primarily to do a collaborative painting. “It has a collage affect because it has things on it that are actually things like a watch and a braid. It’s more than just a large painting,” she added.